What is considered clean eating? The definitions may vary but in the most basic sense it is foods that are free of artificial sweeteners & dyes, no hydrogenated oils, and anything else that is unnatural or unnecessary. See, the last part of the definition is where it could vary from person to person. I believe that if you've found the most basic foundation for your wellness, you can add or subtract from what you'll consider eating and this will change over the years (and hopefully improvements are made). 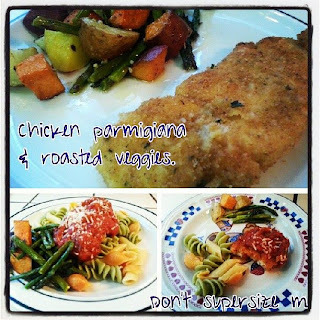 I've made chicken parmigiana on my blog before. The recipe is similar to the last recipe but I changed the crushed crackers to a different brand in my pantry (free of hydrogenated oils and no HFCS). I made the chicken two ways. One with the breading and a side of roasted veggies: asparagus, white and sweet potatoes. The other is with traditional tomato sauce over the chicken and pasta served with the veggies. Every meal should have a serving (minimum) of fruit or vegetables. The image on the bottom right should read: Don't supersize me. Children should not eat the same portion of food that the parents are consuming. Their balled up fist is the same size as their stomach as your fist is to your stomach. Fruits and vegetables don't require a 'portion size' - they are nutrient dense foods and should be consumed frequently through the day. Seven servings of produce is required for children daily whereas 9-13 servings are required for adults. As an adult, you'll eat the higher end of the recommendation if you're active!